Moving house is commonly acknowledged to be one of the most stressful processes one can go through in life. Throw a few of children into the mix and what was already a stressful day could get even harder. But, as with most things, a bit of planning ahead can make the process easier for everyone involved. 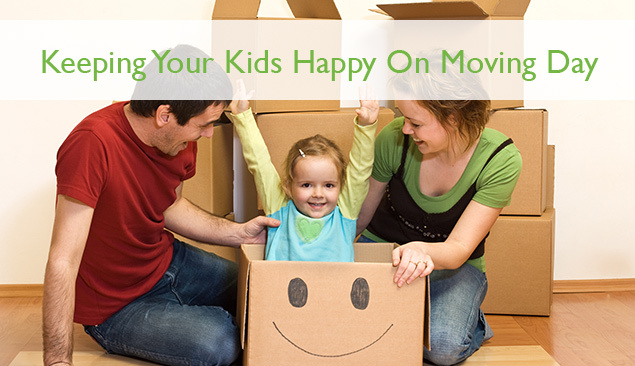 Here are our top five tips for keeping your kids happy on moving day. Talk to your children so they know what to expect. If they are very young, you don’t have to go into great detail about it, but give them time to get used to the idea. Talk about their ‘new’ room and where their toys and belongings are going to go. Often children may be unhappy at the thought of a move – don’t ignore this. Talk to them about their fears, acknowledge them and work together to find some positives about the move. Make sure you talk to them about what will happen on moving day so that they understand what will be happening. For very small children, this could be as simple as giving them a ‘special’ bag to pack their most precious toys and teddies in. Older children can be tasked with decluttering their belongings before packing – incentivise (aka bribe!) them by offering a treat of reward for doing so. Again, involving them in advance will mean a happier team on moving day. Something as simple as an ‘essentials’ box for moving day, that travels with you in the car and contains necessities like a kettle, tea bags, cups and mugs, snacks and anything else you consider vital for moving day could be a huge help. If you are moving with kids, then add a “children’s essentials” box too. This could contain their electronic devices, chargers, books, games, DVDs – anything that they will want to get their hands on easily and will help keep them amused while you get on with the unpacking. Focus on getting the children’s rooms unpacked and set up first as they will be so much happier in an unfamiliar new home if they have some familiar things around them. At the bare minimum, try to get their bed built and have a few toys out before bedtime. Involving children in the move helps them to understand and accept the move to a new home. But sometimes, if it is a complicated move or you have very young children, it is often simpler all round to have them looked after by someone while to move is under way.